By now, 105 uBiome kits were registered in our Quality of Life form (out of 300+ sets sent). 16 volunteers have submitted all 3 samples and 23 registered one or two kits. Over half of our participants have not yet started the study. We hope that this post will answer some of their questions on where to start. The goal of MEBO Gut Microbiome study is to identify microbial communities associated with flare ups and remission of systematic malodor or PATM conditions. Participants are asked to answer MEBO Quality of Life (QoL) questionnaire about the last 24 hrs before every sample is taken. The Questionnaire is embedded into English and Spanish posts about the study. The answers are used to calculate total QoL score that increases with less odor and more wellbeing. The questionnaire evaluates physical health, psychological health, social support and environment such as diet and exercise. 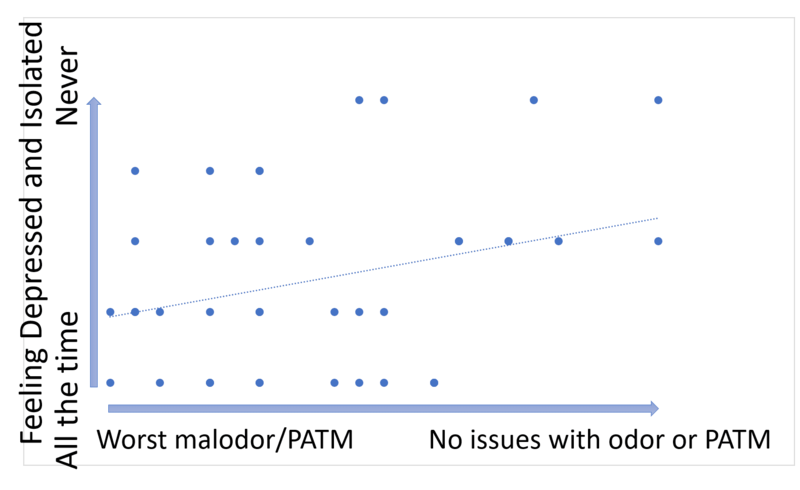 A separate score is calculated for MEBO (malodor/PATM) symptoms. This post is about preliminary results of the first 41 uBiome kits representing samples from 24 participants. Quality of Life scores varied from 55 to 149 (best, "ideal" quality of life would be 150), while MEBO scores ranged from 3 (experienced MEBO/PATM symptoms "all the time" and odor was lingering for hours at 10 feet and farther) to 25 (100% odor free). 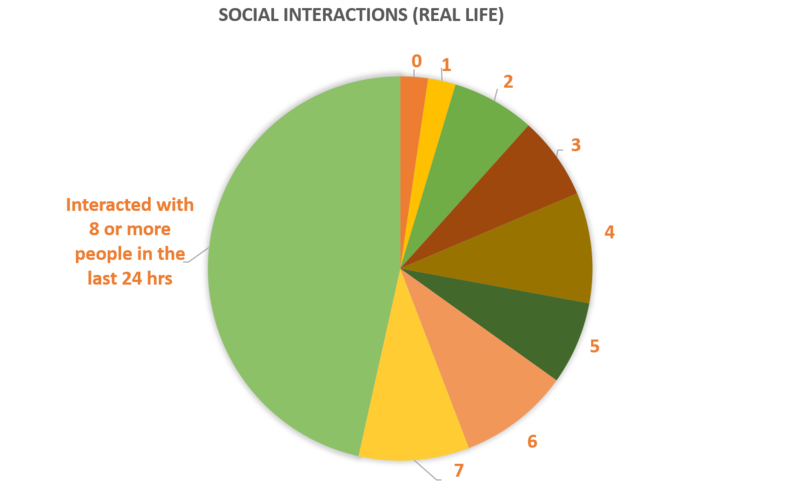 The pie chart on the right shows social environment for MEBO volunteers: almost half of study participants had active social lives interacting with over 8 people per day. Almost 20% of social interactions were entirely positive, while 10% were entirely negative. 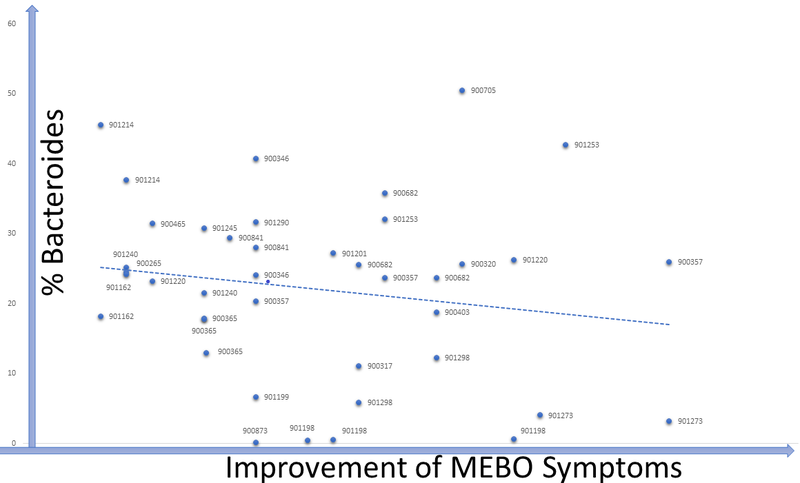 Social support did not correlate with MEBO symptoms and it was not predictor nor protective of malodor. Graphs of depressive feelings vs odors is another prove that even with stress as a trigger, body odors are not all in your head. Obviously, those free of malodors tend to be happier, but it's possible to control depression even with worst MEBO symptoms and happy mood, alone, does not help to control the symptoms. uBiome provides a multitude of measurements characterizing gut microbiomes. One of the most widely used metrics is gut diversity metrics. Microbial diversity is cornerstone of a good health and decreased diversity is likely to be associated with poor wellbeing including malodors. Our data, however, show that most MEBO volunteers have healthy diversity scores that do not correlate with incidence of odors. 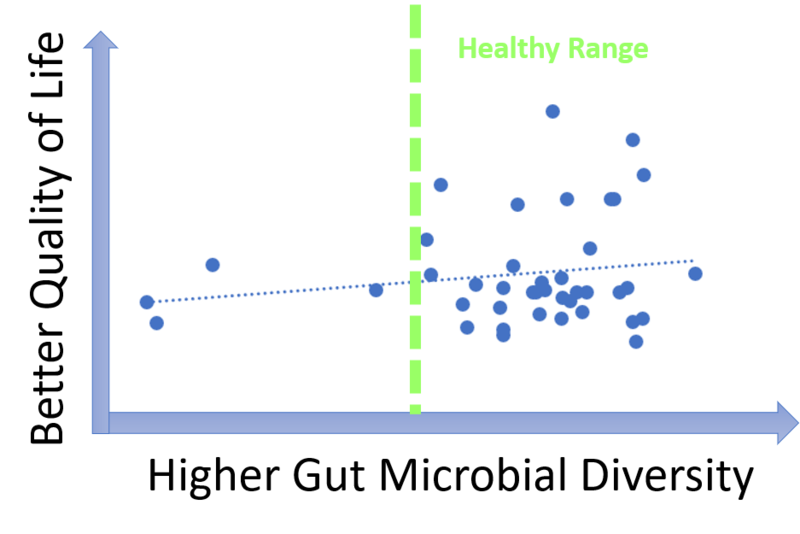 Correlation is observed only for cases of very low, unhealthy diversity, especially for total quality of life scores as opposed to just malodor symptoms. Even more so, MEBO volunteers in remission, completely free of odors, had healthy, but not the very best diversity scores. In extremely diverse communities, people may be less inclined to trust each other, vote and volunteer for activities. In people not suffering from uncontrollable odors, microbes and hosts have a balanced dialogue, and form symbiotic relationships beneficial for both parties. Could it be that MEBO sufferers have more "smelly" bacteria and less bacteria neutralizing the smell? Levels of traditional probiotic strains in the study participants do not seem to correlate with their odor levels. As more data is accumulated, interesting patterns are emerging for less common bacteria. An example is Anaerovorax, bacterium that processes putrid-smelling compounds produced by clostridia, pseudomonads, lactic acid and other bacteria from amino acids in food. Anaerovorax is observed in only 3% of uBiome samples, but it is present in a quarter of MEBO participants. 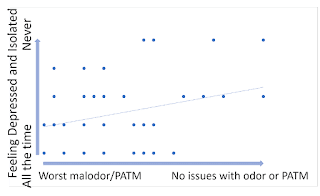 Plotting its levels in all samples with Anaerovorax present against the scores representing improvement of MEBO symptoms (from worst odor to no odor), shows a clear trendline - the more Anaerovorax, the less odor. We note that this seem to be the case for ONLY a subset of study participants. For example, participants #901298 and #901240 who contributed 2 samples each into the first 41-sample-set, had 0 Anaerovorax on their worse day and over 0.03% Anaerovorax on their better days. # 901240 submitted 2 "bad day" samples (which is perfectly fine - as it still yielded much needed data!) had a little more Anaerovorax on a slightly better day. 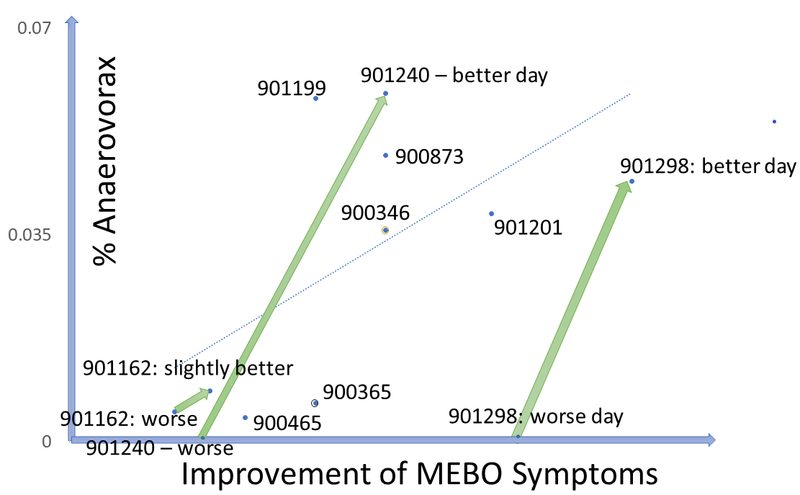 #90346 had experienced exactly the same MEBO symptoms on both days of sampling, but the result with 0 Anaerovorax corresponded to a worse Quality of Life score. #90365 experienced exactly the same symptoms for days with and without Anaerovorax, and had the same Quality of Life Score, but there was a noticeable difference in diet. This person had more Anaerovorax when consumed more odor triggers in food (onions and vinegar). There is not much known about the role of Anaerovorax in human gut. It is proposed to increase when adding meat to a usually vegetarian diet and with increased fasting insulin levels. It is also increased in healthy preadolescent children (7 to 12 years old) and by minerals such as Zinc and Manganese. Levels of TMA-producing bacteria such as Desulfibrio and Bacteroides seem to lower when odor levels are decreasing in most cases, although signal-to-noise ratio is weak and the dependence is very individual (see Figure). The trend is similar for #901214, #90265, #900841 and #901273. #901253 is one of the outliers: MEBO symptoms in this case were improving with higher levels of Bacteroides and lover diversity (and a much stricter diet). Bacteroides maintain a complex and generally beneficial relationship with the host. The genus Bacteroides makes up to 30% of the bacteria in the human gut. Levels of Bacteroides increase with rapid weight loss. Specific species of Bacteroides, have a role in preventing infection with Clostridium difficile. Level of Bacteroides, however, increase (or significantly decrease) in inflammatory bowel disease and chronic fatigue syndrome. Lactobacillus and bifidobacteria probiotics, garlic, walnuts and barley could all decrease levels of Bacteroides. Polydextrose (dietary fiber found in traditional bakery items, beverages, dairy products and sauces) not only decreases Bacteroides but also increases probiotic strains of Lactobacillus and Bifidobacterium. These are only preliminary results. We'll be looking at more complex patterns in bacterial community structures associated with different subgroups of study participants. We'll be posting new findings as we mine more data and get additional results. If you have not started the study yet, we hope that this post encourages you to start participating. As you see, every data point counts, even if the results of your experimentation and odor reduction approaches are not as good as we wished. Vemuri R, Gundamaraju R, Shastri MD, Shukla SD, Kalpurath K, Ball M, Tristram S, Shankar EM, Ahuja K, Eri R. Gut Microbial Changes, Interactions, and Their Implications on Human Lifecycle: An Ageing Perspective. BioMed research international. 2018;2018. Zhang Q, Xiao X, Li M, Yu M, Ping F, Zheng J, Wang T, Wang X. Vildagliptin increases butyrate-producing bacteria in the gut of diabetic rats. PloS one. 2017 Oct 16;12(10):e0184735. Roeder J, Schink B. Syntrophic degradation of cadaverine by a defined methanogenic coculture. Applied and environmental microbiology. 2009 Jul 15;75(14):4821-8. Lau SK, Teng JL, Chiu TH, Chan E, Tsang AK, Panagiotou G, Zhai SL, Woo PC. Differential Microbial Communities of Omnivorous and Herbivorous Cattle in Southern China. Computational and structural biotechnology journal. 2018 Jan 1;16:54-60. Filocamo A, Nueno-Palop C, Bisignano C, Mandalari G, Narbad A. Effect of garlic powder on the growth of commensal bacteria from the gastrointestinal tract. Phytomedicine. 2012 Jun 15;19(8-9):707-11. Cruden DL, Galask RP. Reduction of trimethylamine oxide to trimethylamine by Mobiluncus strains isolated from patients with bacterial vaginosis. Microbial Ecology in Health and Disease. 1988 Jan 1;1(2):95-100. Craciun S, Balskus EP. Microbial conversion of choline to trimethylamine requires a glycyl radical enzyme. Proceedings of the National Academy of Sciences. 2012 Dec 26;109(52):21307-12. ● Estar en un estudio es voluntario: tu elección. ● Si se une a este estudio, puede detenerse en cualquier momento. ● Nadie puede prometerle que un estudio lo ayudará. ● No se una a este estudio a menos que se respondan todas sus preguntas. MEBO Research, Inc., ("MEBO") es una campaña internacional de defensa del paciente fundada por el paciente registrada en el Estado de Florida, EE. UU., Desde el 21 de abril de 2010, según la sección 501 (c) (3) del Código de Rentas Internas, clasificada como empresa pública de beneficencia. MEBO Research también está registrada en Inglaterra y Gales como una empresa sin ánimo de lucro, limitada por garantía (2009). MEBO es un miembro de la organización NORD y EURORDIS y sus directores son moderadores de la comunidad Trimethylaminuria en RareConnect.org. MEBO se menciona como una organización de apoyo y defensa en sitios web como Genetic Alliance y Orphanet. MEBO significa olor corporal metabólico e incluye olor corporal sistémico, mal aliento y episodios continuos de mal olor NO relacionados con la higiene o el exceso de gases. PATM denota la condición "Personas alérgicas a mí" ("People Allergic to me" . Está invitado a participar en un estudio de investigación sobre dinámica microbiana en condiciones MEBO y PATM. Esperamos aprender qué comunidades microbianas están asociadas con los brotes y las remisiones de estas afecciones y las mejores formas de reducir los síntomas. Usted fue seleccionado como posible participante en este estudio porque demostró buenas habilidades de comunicación y disposición para seguir regímenes alimentarios nutricionalmente equilibrados y contribuir con datos de seguimiento de resultados. Este estudio de investigación está buscando hasta 100 personas con todas las manifestaciones de mal olor corporal, halitosis y / o PATM. Esperamos inscribir a los participantes del estudio de investigación en todos los Estados Unidos e internacionalmente. Su participación en este estudio es completamente voluntaria. Su decisión de no participar no tendrá ningún efecto negativo en usted ni en su atención médica. Puede decidir participar ahora o retirar su consentimiento en cualquier momento durante el proceso de estudio sin ninguna pérdida de beneficios o atención médica a la que pueda tener derecho, si corresponde. Se espera que este estudio de investigación tome aproximadamente un año. Si decide participar, la Directora de Protocolo, Irene Gabashvili, PhD, y su personal de estudio de investigación, María de la Torre abordará todos los asuntos relacionados con este proceso de investigación con usted por escrito y por correo electrónico a la dirección de correo electrónico que proporcione. Su respuesta formal a dichas comunicaciones también deberá ser por escrito por correo electrónico. De esta manera, se presentarán instrucciones claras, cuadros, gráficos, resultados, calendario y sus comentarios de manera ordenada. Ninguna de las encuestas u otros procedimientos utilizados por los investigadores en este estudio de investigación son invasivos o experimentales. Los procedimientos involucrados no implican riesgos significativos, y no hay compensación o tratamiento disponible si la lesión ocurre como resultado de la participación. Los hisopos y otros materiales utilizados para la recolección de muestras se esterilizan antes del envío y se deben manipular con el cuidado e higiene adecuados. Si no se siente cómodo manipulando el kit de recolección y aceptando la responsabilidad de su uso, reconsidere su participación en este estudio. Después de que devuelva su muestra a través del correo prepago, su informe de prueba uBiome Explorer estará disponible a través de su portal para pacientes aproximadamente 6 semanas después. También recibirá un correo electrónico notificándole que sus resultados están listos. Cualquiera de sus muestras que se utilizan en la investigación puede dar como resultado nuevos productos, pruebas o descubrimientos. En algunos casos, estos pueden tener un valor comercial potencial y pueden ser desarrollados y ser propiedad de uBiome u otros. Nuestro acuerdo con Ubiome les permite presentar cualquier patente relacionada con los resultados de las pruebas. Sin embargo, los donantes de muestras no retienen ningún derecho de propiedad sobre los materiales. Por lo tanto, no compartiría ningún beneficio financiero de estos productos, pruebas o descubrimientos. La información de los análisis de sus muestras codificadas y su información médica codificada se colocará en una de las bases de datos de los Institutos Nacionales de Salud (NIH) junto con la información de los otros participantes de la investigación y se utilizará para futuras investigaciones. Estas bases de datos serán accesibles por Internet. Solo la información anónima de los análisis se colocará en una base de datos completamente pública, disponible para cualquier persona en Internet. No se colocará en la base de datos pública ninguna información de identificación utilizada tradicionalmente sobre usted, como su nombre, dirección, número de teléfono o número de seguro social. Si bien la base de datos pública no contendrá información que se usa tradicionalmente para identificarlo, las personas pueden desarrollar formas en el futuro que permitan que alguien vincule su información médica en nuestras bases de datos. Por ejemplo, alguien podría comparar información en nuestras bases de datos con información suya (o un familiar de sangre) en otra base de datos y ser capaz de identificarlo a usted (o a su pariente consanguíneo). También es posible que haya violaciones a la seguridad de los sistemas informáticos utilizados para almacenar los códigos que relacionan su información genética y médica con usted. Sin embargo, su privacidad es muy importante para nosotros y utilizaremos medidas de seguridad para protegerla. A pesar de todas las medidas de seguridad que utilizaremos, no podemos garantizar que su identidad nunca se conozca. · Seguir las instrucciones del Director del Protocolo y del personal del estudio. · Informe al Director de Protocolo o al personal del estudio de investigación sobre cualquier efecto secundario, visita al médico u hospitalización que pueda tener. · Guarde sus diarios según las instrucciones. · Complete sus cuestionarios según las instrucciones. · Haga preguntas mientras piensa en ellas. · Dígale al Director de Protocolo o al personal de investigación si cambia de opinión acerca de permanecer en el estudio. Si primero acepta participar y luego cambia de opinión, puede retirar su consentimiento y suspender su participación en cualquier momento. Su decisión no afectará su capacidad de recibir atención médica para su enfermedad y no perderá ningún beneficio al que de otra manera tendría derecho. Si decide retirar su consentimiento para participar en este estudio, debe notificar a María de la Torre a maria.delatorre@meboresearch.org. Existen riesgos, incomodidades e inconvenientes asociados con cualquier estudio de investigación. Estos merecen una reflexión cuidadosa. Debería hablar con el Director de Protocolo si tiene alguna pregunta. • Algunas preguntas de la encuesta pueden hacer que usted los miembros de su familia se sientan incómodos. • Sus datos, respuestas de la encuesta y / o información de identificación personal pueden verse comprometidos en caso de incumplimiento de la seguridad o incumplimiento del protocolo. En caso de incumplimiento, si sus datos están asociados con su identidad, pueden hacerse públicos y pueden tener consecuencias sociales y psicológicas para usted o sus seres queridos. • Cuando los investigadores publican los resultados de este estudio, su información puede incluirse en resúmenes agrupados que se hacen públicos. La identificación de sus datos a nivel individual de esos resúmenes sería extremadamente difícil, pero es posible que un tercero que haya obtenido datos parciales de usted pueda comparar sus datos parciales con los resultados publicados y determinar indirectamente algunas de las respuestas de su encuesta. • Si bien la información que guardamos no incluye nombres, y el microbioma no es identificable de manera única, la información genética humana es única y se puede utilizar para identificar personas al vincular o rastrear ADN en bases de datos públicas. • Al igual que con cualquier servicio en línea, si divulga la contraseña de su cuenta a otras personas, es posible que puedan acceder a su cuenta y a su información. Puede haber riesgos adicionales para la participación que actualmente son imprevisibles. No podemos garantizar ni prometemos que recibirá algún beneficio de este estudio. La alternativa es no participar en este estudio. No debe sentirse obligado a aceptar participar. Sus preguntas deben responderse claramente y para su satisfacción. Si decide no participar, dígaselo al Director del Protocolo. Se le informará sobre cualquier nueva información importante que se aprenda durante el curso de este estudio de investigación, lo que podría afectar su condición o su deseo de continuar participando en este estudio. 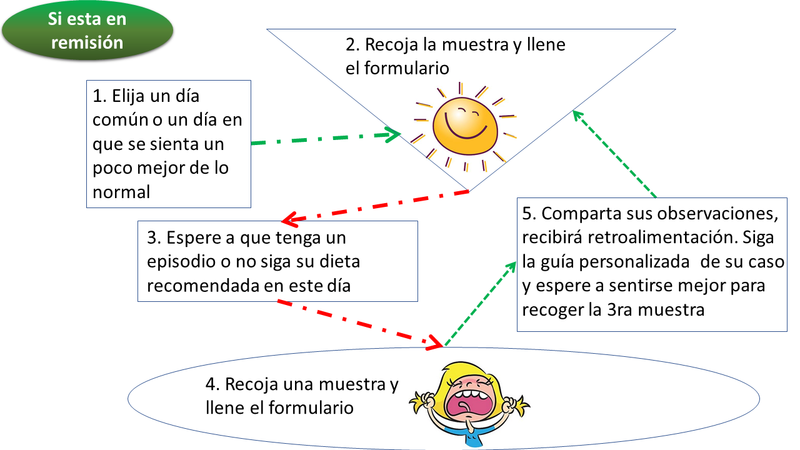 Una descripción de este ensayo clínico estará disponible en http://www.ClinicalTrials.gov, según lo exige la ley de los EE. UU. Este sitio web no incluirá información que pueda identificarlo. Como máximo, el sitio web incluirá un resumen de los resultados. Puede buscar este sitio web en cualquier momento. Una descripción de este ensayo clínico está disponible en https://clinicaltrials.gov ct2/show/NCT03582826, según lo exige la ley de los EE. UU. Este sitio web no incluirá información que pueda identificarlo. Como máximo, el sitio web incluirá un resumen de los resultados. Puede buscar este sitio web en cualquier momento. Los resultados de este estudio de investigación pueden presentarse en reuniones científicas o médicas o publicarse en revistas científicas. Su identidad y / o su información personal de salud no se divulgarán a menos que lo autorice o lo exija la ley. Sin embargo, siempre existe el riesgo de que incluso la información no identificada pueda volver a identificarse. La información del paciente se puede proporcionar a las agencias reguladoras federales y otras según se requiera. La Administración de Alimentos y Medicamentos (FDA), por ejemplo, puede inspeccionar los registros de investigación y conocer su identidad si este estudio cae dentro de su jurisdicción. Debido a que la información sobre usted y su salud es personal y privada, generalmente no se puede utilizar en este estudio de investigación sin su autorización por escrito. Si firma este formulario, proporcionará esa autorización. El formulario está destinado a informarle sobre cómo se usará o divulgará su información de salud en el estudio. 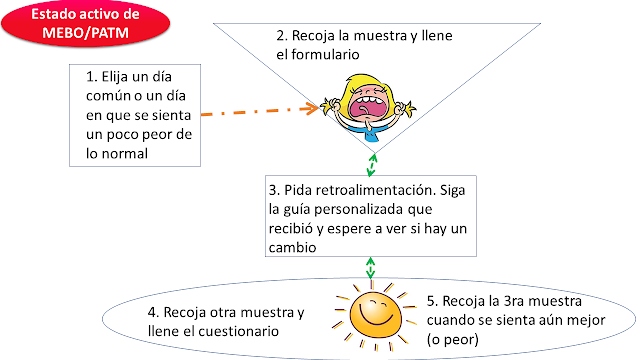 Su información solo será utilizada de acuerdo con este formulario de autorización y el formulario de consentimiento informado y según lo requiera o permita la ley. Por favor léelo detenidamente antes de firmarlo. ¿Cuál es el propósito de este estudio de investigación y cómo se utilizará mi información de salud en el estudio? El propósito de este estudio es conocer qué comunidades microbianas están asociadas con brotes y remisiones de mal olor y condiciones de PATM. La información de alguna forma se enviará al patrocinador, uBiome. Su información no identificada puede incluirse en resúmenes agrupados cuando los investigadores publican los resultados de este estudio. ¿Debo firmar este formulario de autorización? No es necesario que firme este formulario de autorización. Pero si no lo hace, no podrá participar en este estudio de investigación. Firmar el formulario no es una condición para recibir atención médica fuera del estudio. Si firmo, ¿puedo revocarlo o retirarme de la investigación más tarde? ¿Qué información personal se obtendrá, utilizará o divulgará? Su información de salud relacionada con este estudio se puede usar o divulgar en conexión con este estudio de investigación, que incluye, entre otros, la gravedad de sus síntomas y los resultados de las pruebas de laboratorio. ¿Quién puede usar o divulgar la información? ¿Quién puede recibir o usar la información? · La Oficina de Protección de Investigaciones Humanas en el Departamento de Salud y Servicios Humanos de EE. UU. Su autorización para el uso y / o divulgación de su información médica finalizará el 31 de diciembre de 2019 o cuando finalice el proyecto de investigación, lo que ocurra primero. ¿El acceso a mi historial médico será limitado durante el estudio? Para mantener la integridad de este estudio de investigación, es posible que no tenga acceso a ninguna información de salud desarrollada como parte de este estudio hasta que se complete. En ese momento, tendrá acceso a dicha información de salud si fue utilizada para tomar una decisión médica o de facturación sobre usted (por ejemplo, si está incluida en su registro médico oficial). No se le pagará para participar en este estudio de investigación. No hay ningún costo para usted por participar en este estudio, aparte de los gastos básicos como el uso de Internet y el tiempo personal que le llevará completar los cuestionarios. Se les puede pedir a los participantes internacionales que donen a MEBO Research para compensar parcialmente los costos de envío. uBiome y MEBO Research brindan apoyo financiero y / o material para este estudio. uBiome está respaldando las pruebas de microbioma y el análisis parcial de los resultados, y los costos de envío internos. MEBO Research cubrirá los costos de envío internacionales. Todas las formas de diagnóstico y tratamiento médicos, ya sean de rutina o experimentales, implican cierto riesgo de lesión. A pesar de todas las precauciones, es posible que desarrolle complicaciones médicas al participar en este estudio. Si surgen tales complicaciones, el Director del Protocolo y el personal del estudio de investigación lo ayudarán a obtener el tratamiento médico adecuado. En el caso de que tenga una lesión o enfermedad causada directamente por su participación en este estudio, se solicitará primero el reembolso de todos los costos relacionados de la atención de su aseguradora, plan de atención administrada u otro programa de beneficios. Usted será responsable de cualquier copago o deducible asociado según lo requiera su seguro. Si los costos de la atención relacionados con dicha lesión no están cubiertos por su aseguradora, plan de atención administrada u otro programa de beneficios, usted puede ser responsable de estos costos. Si no puede pagar dichos costos, el Director de Protocolo lo ayudará a solicitar los beneficios suplementarios y le explicará cómo solicitar la asistencia financiera del paciente en el hospital. Usted no renuncia a ningún derecho de responsabilidad por daños personales al firmar este formulario. Preguntas, inquietudes o quejas: si tiene alguna pregunta, inquietud o queja sobre este estudio de investigación, sus procedimientos, riesgos y beneficios, o cursos alternativos de tratamiento, debe preguntar al Director del Protocolo. Notificación de lesiones: si siente que ha sido lastimado por ser parte de este estudio, comuníquese con el Director del Protocolo o el Personal de Investigación. Preguntas, inquietudes o quejas: si tiene alguna pregunta, inquietud o queja sobre este estudio de investigación, sus procedimientos, riesgos y beneficios, o cursos de tratamiento alternativos, debe preguntarle a la directora de protocolo, Irene Gabashvili, en irene.gabashvili@meboresearch.org. También debe contactarla en cualquier momento si siente que ha sido lastimado por ser parte de este estudio. y se le dará la oportunidad de decidir dar su consentimiento o no a un experimento médico sin la intervención de ningún elemento de fuerza, fraude, engaño, coacción, coacción o influencia indebida en la decisión del sujeto.